Is sour dough starter and friendship bread starter the same and can they be used interchangably? Just making sure I have this right…… If I make a starter, I follow the normal 10 day instructions then on the 10th day I bake with one cup of my mixture and give the other 3 away and they begin with their 10 day instructions or do I not bake that 10th day …..thanks! Here is another way to make the bread. Eliminate the vanilla pudding, use only 1 3/4 cups of flour, add 1/4 cup of dry farina, peel, core and cut a granny smith or honey crisp apple into small pieces. Dust the bottom of the pan with the entire amout of sugar and cinnamon (don’t put on the top). Pour 1/4 of the batter into the pan, then layer with the cut up apple, then pour the remaining batter on the top and bake. It is really good and doesn’t have the added sugar from the pudding. The apple tops it off just right too. I am totally confused. When making the “starter”, it says to consider that day as day 1. That I understand. But then it says ” for the next 10 days” do this and that. Is this a 11 day bread or should that have read …”for the next 9 days” do this and that ? I hope I haven’t ruined my starter since I am going by the 11 day thing. I started my starter on Sat. Did nothing Sun., stir mon , tues and Wed. Added the milk, sugar and flour today. Since then I have looked up other “starter” and it says the day you mix up your starter is day 1 and then do this and that for the next 9 days. Have I ruined mine ??? Christine: I am certainly no expert at this, but when the directions say consider the day that you make the starter day one, take it literally. In years past, I have gone over two weeks past the 10 days, (I am ashamed to admit! ), before I made my bread, and it didn’t have any affect on it whatsoever. So one day isn’t going to matter at all. 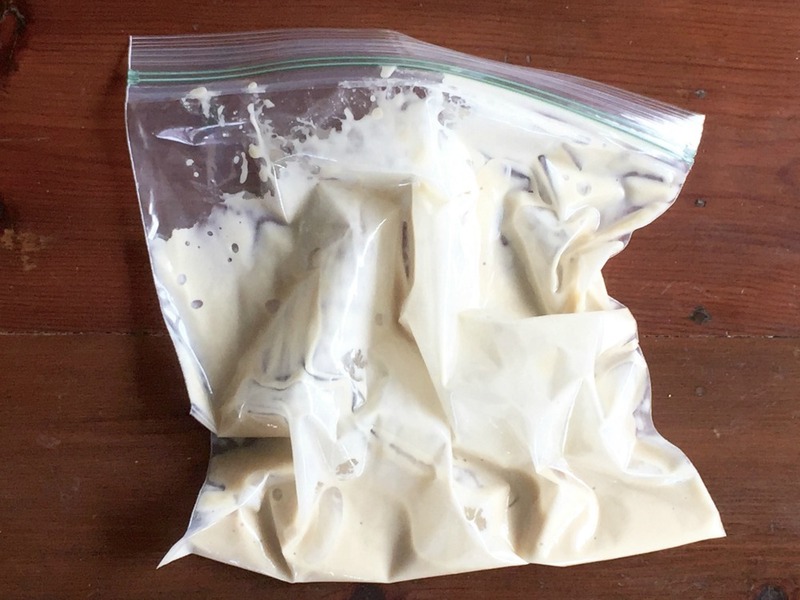 As long as you let the air out of the bag, when it inflates do to the yeast, if you use ziploc bags, and continue to stir it, it will be just fine. This stuff is pretty hard to mess up, so you haven’t ruined anything!!! Relax, and happy baking!!! (And this comes from a man that is not a baker……I just love this bread!). I remember Friendship Bread from when I was a kid. My mom and her girlfriends used to trade the starters back and forth. I was excited to try making the starter today. I guess I mixed up the directions a bit…while multi-tasking… and added the flour and sugar to the yeast mixture and then poured in the milk. Will this still work. I’d rather start over on day 1 than figure out on day 10 that I can’t bake the bread or share the batter with friends. BTW, the mixture looks just like the description of pancake batter. I was wondering how long can you freeze the starter for? Indefinitely! Check our FAQs for more on freezing your starter, but it’ll keep until you need it, even if it’s a couple years later! I have used a frozen starter a year later, and it was fine. I also use a wire whisk…doesn’t seem to change the bread at all. I wish I could make a starter and bake it immediately!!! I hate to wait the ten days! Oh, by the way, you can mess up the starter along the way, and it doesn’t change the outcome! I forgot the day I was supposed to add…added two days later than when I should have with no problem. It’s a very ‘forgiving’ dough!! i make my starter with just, 1 cup milk, 1 cup flour, 1 cup sugar. i love making different flavors, and making mini muffins, or even a bundt pan. so many diffent flavors, The favorite is lemon poppy seed and Cherrycheese cake. i have had a starter going since Thanksgiving. Love the friendship bread. I haven’t had friendship bread in years. The one I remember is from when I was a kid and my mom had it in a jar. But the one she would do she would had fruit to the mix during the 7 or 10 days. It was an okay bread but these look so much better. Going to start me a starter tomorrow. Thank you so much for sharing. I used to to make an Amish Friendship Bread that the starter was instant potato flakes. I still have the recipe somewhere, your recipe inspires me to start making it again. Thank you! What do you do if you just want to make the starter and the bread, but don’t want extra bags to share. Bake off the extra bags, or freeze them to save for a later date, Paula. On Day 10 you’ll have enough starter for 4-7 recipes, with each recipe yielding 2 loaves each. You could gift everyone in your neighborhood with Amish Friendship Bread! (and the bread freezes well, too). Good luck! THANK YOU THANK YOU THANK YOU, for posting this starter recipe can’t wait to get started!!! Do you start feeding the starter the day after you mix it up? How often do you feed it and how much? Hi Carol! You receive or make it on Day 1, squeeze every day, add ingredients on Day 6 and Day 10. The full instructions are here: https://www.friendshipbreadkitchen.com/amish-friendship-bread. I have also seen starters that only use water, flour, sugar. I noticed yours uses milk, won’t the milk really sour fast – could it get dangerous to eat. Hi Carol! Amish Friendship Bread has been around for several decades — it’s not my recipe. The milk doesn’t sour or spoil — there are people who’ve had their AFB starters for several years. I couldn’t explain the science of the starter, but it has something to do with the fact that the starter is fermenting. Here is a link you may find helpful: http://www.ext.colostate.edu/safefood/newsltr/v1n2s04.html. Hope this helps answer your question and allay any concerns! Pam, you can look up the full starter recipe at momswhothink.com. Reference Amish Friendship Bread, and they have a clearly delineated recipe for both the starter and the bread. I had trouble locating both on this site as well. Good luck! I was wondering if on day 10 when you go to bake if you could possibly divide the batter and make two different kinds of bread? Or would it be to much pudding in each loaf? Hi Becky! We do this all the time in the Kitchen — we mix all the base ingredients together and then separate it into two different batters and add the additional ingredients that’ll make them different. You’ll end up with two different loaves. And because the instructions vaguely refer to “1-2 boxes of pudding,” you can either divide the pudding or put a whole box in each recipe (if you’re doing one chocolate and one vanilla, for example). Let me know what you end up doing, Becky — we’ve done it both ways and both work well. I did divide out the mix and used two different pudding mixes. One was Lemon and the other was Pistachio. I used a whole, small box each and they turned out really brown, but they were both good!! I haven’t made the Amish Friendship Bread for more years than I care to say. So Ii thought I would look for a starter recipe. I noticed, when looking for Friendship Bread Starter, that some of the recipes call for yeast, and some don’t. I can’t remember if I used yeast or not. Which is better for a denser bread, which is what my family loved? I also don’t recall using Pudding Mix in the batter. Can you clear this up for me? Have there been a lot of changes since the 70s? Because Amish Friendship Bread is essentially a culinary “chain” letter, it’s probably taken many forms before the one that circulates now. In Europe it’s known as Herman or Hermann bread, and is often accompanied by a similar letter that also include a prayer by Padre Pio. I don’t know who or when the pudding mix got added, but it does boost flavor and moisture, though you could easily omit it as well (or use our homemade pudding mix recipes, found in the Recipe Box). You shouldn’t need any additional yeast — the starter is a yeast starter — but some of the recipes in the Box may have found better success in adding a “boost.” I think the biggest change since the 70’s in the presence of wild yeasts in the air — I think that may have decreased which is why it’s sometimes difficult to “start” a starter without a commercial yeast boost. Hope this helps and thanks for joining me in the Kitchen! Gave “birth” to a sugar free starter just to try it a couple days ago, today decided to start a regular one. Love it!!! How did that sugar-free starter worked for you? Do you mind sharing the recipe? Thanks! Just check the Recipe Box, Liz! Great site here! I would love to make this recipe but my husband is diabetic and I am a little concerned about the amount of sugar used. Is it possible to use less sugar for the starter? 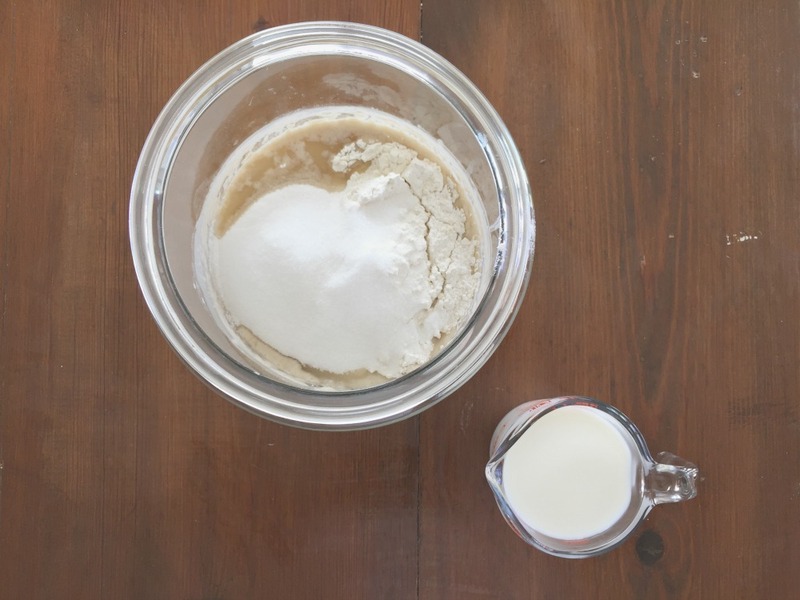 If I am making a bunch of starters with around 26 kids that I only see once a week, and we are low on money, is it possible to dissolve the yeast in the 1/4 cup water for the 10 minutes and then divide the yeast mixture in half? Add 1/2 cup of the sugar, flour and milk? If so would they only add 1/2 cup on days 6 and 10? And would there be like 2 cups to divide vs 4? I would appreciate your help. Thank You! I have been making friendship bread now for about 6 months. A friend gave me a starter and I have been saving the 3 starters and making more and more bread – everybody loves it. I make the one with pudding and applesause, I change it and make rasin nut, bannana nut it is soooo good. I also give bread to the people who live in tent city, it is such a heavy bread that it keep them not hungry. I thank my friend Debbie and the Amish. I’m confused – the starter recipe references using “whats left in the bowl” and combine with ingredients for the bread (on day 10) but if you go to the bread recipe itself, it says to just use 1 cup of starter. So, which is it? If I use “whats left in the bowl” after removing the (4) 1 cup amounts into ziplocs, I have at least 4 cups left. So, is it one cup of the starter on day 10 or is it “whats left in the bowl”? Thank you! Is it still considered the starter after adding the ingredients for day 10? Please help explain this. This is my first attempt and I’m not sure I did it right. In the old days, what was left in the bowl was 1 cup. 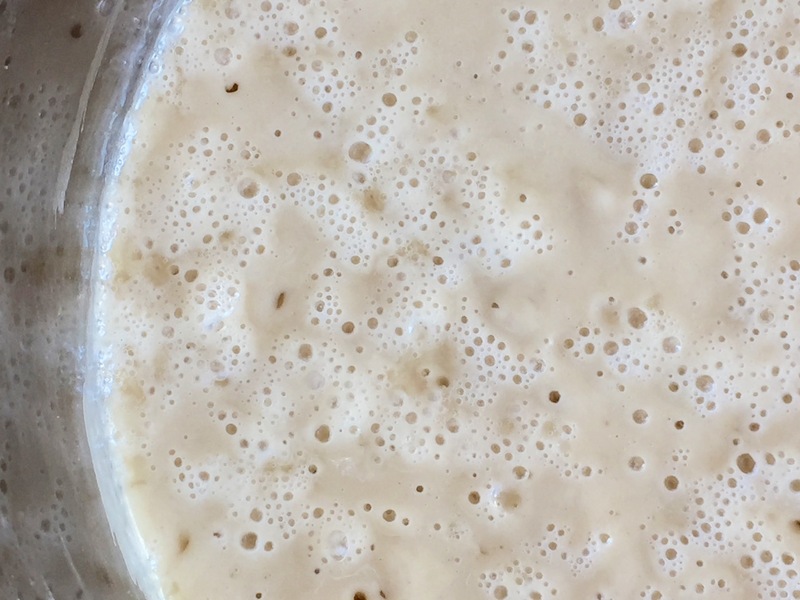 But since so many people make their own starter, the yeast tends to be super active, usually yielding more than 4 cups on Day 10. So we recommend feeding the starter on Day 10, dividing the starter into equal portions of 1 cup, and then baking with 1 and giving the others away or freezing for another time. Hope this helps, Becca! I have always wanted a starter, but could never find a recipe that had tons of great reviews. This one is it……..and I am starting today. 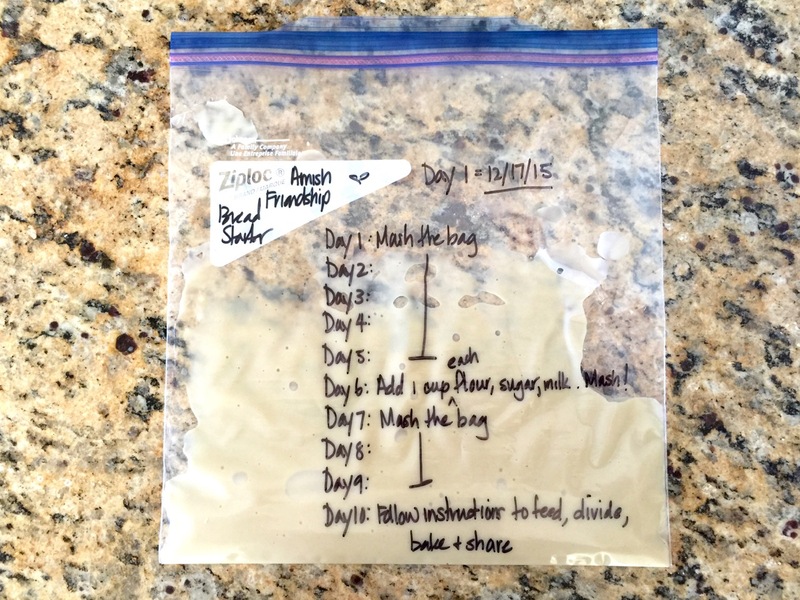 I am just a tad bit confused…..after day 10 do I have to start all over with day 1 and make a new batch of starter? Yes, on Day 10 the recipe is designed to be finished and you’ve passed on what’s left. However, lots of people like to keep a starter on hand so they can bake at any time. If this is what you’d like to do, reserve one of the bags of starter for yourself. If you think you want to bake in 10 days, treat that starter as Day 1 and go through the process again. If you don’t know when you want to bake, pop it in the freezer until you’re ready. You can either bake with it or start the process again (just bring it to room temperature, usually a few hours). The benefit to starting the process again is that you’ll have starter left over to share or save. Thanks Darien, you answered my ?s. Have you ever baked the bread in a metal pan. I kept 2 starters last time so I could make alot of bread to give away, but just have a few glass pans, would a metal bundt pan work? Hi Lola! Yes, as long as the pans are coated and not raw exposed metal (i.e. your grandmother’s old muffin tins). Lola, I use metal pans all the time. Turns out great! I’m on day 10 and want to bake the bread for gifts. Can I use all the batter today and make the bread or do I have to take a cup out and start the 10 days process over again? You will take out the 1 C for making your next batch (if you want to go through the 10 day process) and all the remaining starter is what you will use to make your bread to give away. If you don’t want to re-do the 10 day cycle, then just use everything! Kim, I freeze my starters when I don’t have anyone to give it to. I will take the starter out of the freezer a day or two before I want to cook it. I normally wait until I see the starter begin to bubble again before I cook it, but I have cooked it just a few hours after taking it out of the freezer when I was in a pinch. I couldn’t tell a difference in it. I’m want to take my last bag out of the freezer and start over at Day 1. Do I need to give it “a good feed” before I start the 10 day process? And if so, what is considered a good feed? The full 1 cup each, or is it reduced? I had a recipe for Sour Dough Starter & Bread many years ago and the Starter was never put in the refrigerator. I lost it after all the moves over the years and have never found it since. Does anyone have the recipe for this one? It had a nice scent to it, stayed on the kitchen counter and really made great bread. I am just starting Herman and it has separated with lots of liquid on the bottom. Is it okay? Just mix it back in though it shouldn’t be separating that much if you are mixing or squeezing the bag daily. Look for bubbles to make sure the starter is active — you’ll see more on the days following a feeding than in the middle of the feeding period. I haven’t had a started bag in a while, and have never actually made my own – it’s always been a gift from a friend. I think I’d like to start the tradition this time out! isn’t there a way to not end up with all the starters at the end? I remember it’s by not adding as much of the flour, milk, sugar the last day. Not sure of the ratios though. May I ask what “mash” the bag means? Is it to give it a good squeeze all over? Also do you have metric measures please? Does freezing the starter kill the yeast? I had a recipe for Sour Dough Starter & Bread many years ago and the Starter was never put in the refrigerator. I lost it after all the Military moves over the years and have never found it since. Does anyone have the recipe for this one? It had a nice yeasty scent to it, stayed on the kitchen counter and really made great bread. 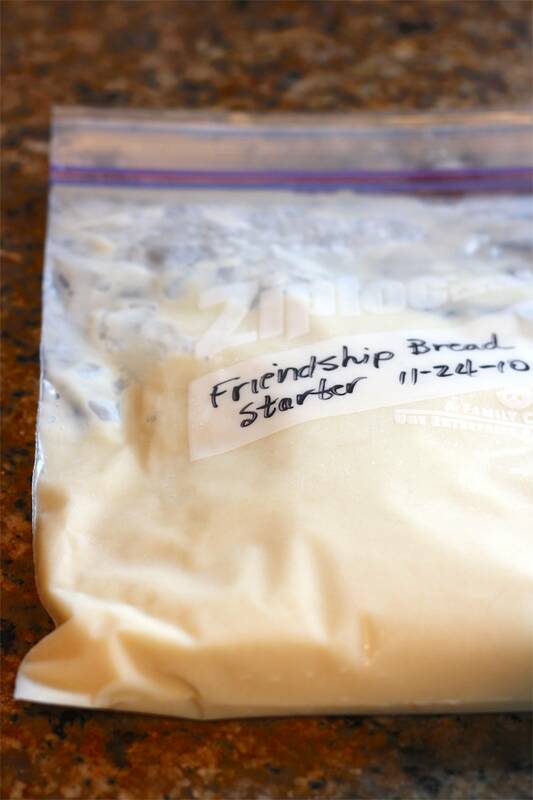 I have had 3 ziplock bags of frozen starter since 2011. I just took 1 bag out the freezer yesterday and brought it to room temp. It looks fine and smells like yeast. I’m concerned that it has not bubbled after mashing it several times yesterday. How long do I need to wait before making the bread? Do I need to ‘feed’ it? I read that term in earlier post, but don’t know what it means, or how it is done. Am I able to to add the ingredient to make the 2 loaves without making extra for sharing? As for the other bags; how do I proceed from the frozen state, to prepare for sharing? Hi Angel! You have a couple of options: use it right away (after it’s thawed, just measure 1 cup) or treat it like Day 6 and do a Day 6 feeding. On Day 10 you can divide it into 1-cup portions to share or freeze, and then bake with 1 cup as well. Some starters don’t bubble up after being frozen for a while without a little kickstart, so even if you do a small feeding, it will help. Good luck! I have an Amish Friendship Bread Starter that I’ve used for more than 15 years now. Someone at work how much I loved to cook, so she gifted me with one of her starters. I’ve never run out so some of that starter from 15 years ago still makes my loaves! Hi Maggie! We love stories like this — we’ve also been gifted various starters over the years and it’s interesting to see how they each look different. If you ever get a chance to take a picture of your starter, I hope you’ll submit it to the photo gallery. Thanks for being in the Kitchen with us! Hi Tabitha! A mason jar is too small — the starter can almost triple in size on a warm day, so you can use a large glass crock (with lid or plastic wrap/dish towel on top) – 3 to 5 gallon, just to be safe. I was wondering if anyone has the friendship poem that goes with the bread it was a poem with the instructions in it. It is fun do this at the holidays with the poem. Anybody? Does this starter ever go in the fridge? Does it stay on the counter all the time? 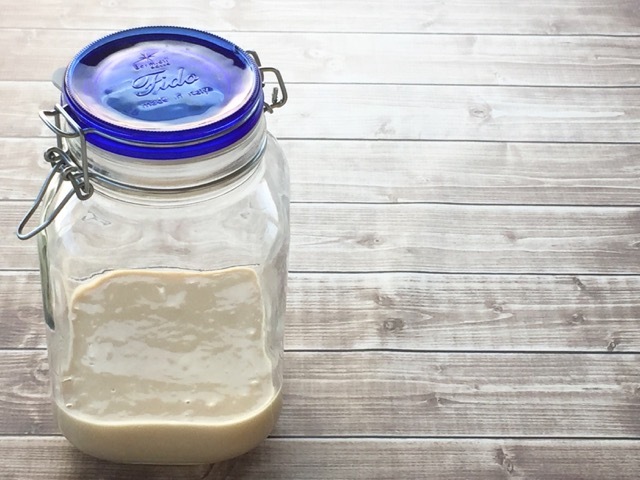 I have a sourdough starter that after I feed it, it goes in the refrigerator for 7 days before I take it back out again to feed it. This starter stays on the counter if you are planning to bake within 10 days. If you aren’t planning to bake in 10 days, then you can slow the process down by putting it in the fridge or freezer. The starter needs to be fed regularly unless it’s frozen. I recommend that if people aren’t planning to bake anytime soon (and don’t want to be up to their ears in starter) that they freeze it, 1 cup per Ziploc bag. There’s a tutorial here: https://www.friendshipbreadkitchen.com/tutorial-reviving-frozen-amish-friendship-bread-starter/. Hope this helps and thanks for visiting the Kitchen! If my friend bagged my starter on 9/13 but she doesn’t give it to me until 9/15 which day do I count as day 1? You should count the day she bagged the starter, but if you’re off by a couple of days, it wouldn’t be a problem if you counted the day you received it (Day 3) as Day 1, Mandi.